I have a fascination with very high and very low tides. Who doesn’t – they’re rare events and when they occur, things happen. Low tides are great for the naturalist; everybody’s out digging clams and exploring rarely exposed beaches and tidepools. Very high tides catch just about everybody’s attention. Coastal flooding and beach erosion can be severe, and beachcombers are out on the wrack line as soon as it’s safe. The surge from a big making tide, like the one shown above, will toss all kinds of things up on the beach. King Tide usually means means you find lots of floats and buoys, like this Uroko buoy. I wonder what it’s story is. A couple years ago I decided to get out on the beach for the biggest daylight spring tide of the year. I took a few photos and in 2013 I posted King Tide and in 2014 Comparing King Tides. There are King Tide Projects all over the world, all coinciding with the highest spring tides of the year. In my neck of the woods, Facebook and Flickr projects are organized each winter to document the highest tides with photos. The idea is to help people visualize sea level rise. This year, King Tide sequences occurred just before Christmas, around January 20th, and around February 18th. 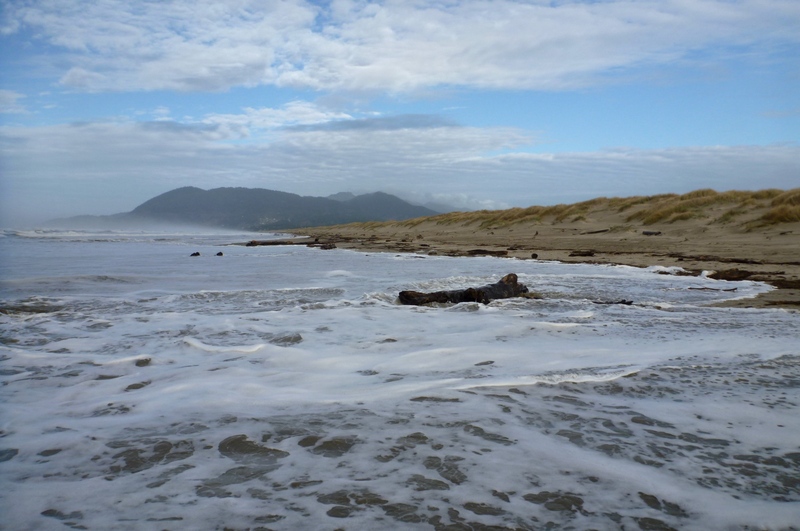 I observed these extreme tides at the same place I have in the past, out on a sand spit with not much human development. Because there aren’t any structures, not even a big rock, there isn’t much in the way of landmarks. Here’s mine. This big stump hasn’t moved much in the last few years. It takes high water – a good high tide and a bit of swell – to give this old giant a soaking. It’s been my marker for the past three King Tides. The sequence above shows how King Tide played out on December 22, 2014. The tide prediction was 9.9′ and the forecast called for 2′ wind waves and an 11 – 13′ west swell. 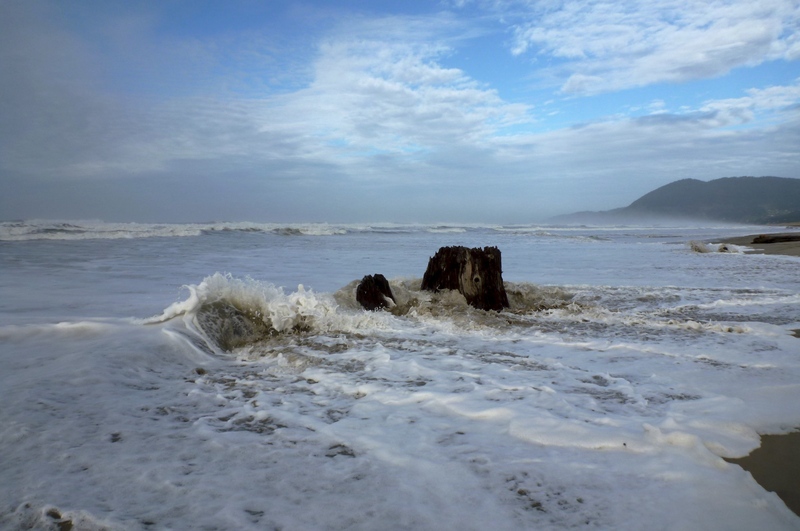 You can see a big swell kiss the stump and then surge past it, up the beach, nearly onto a shelf at the base of the foredune. On the bottom photo you can see the wrack line just above the white water surging up the beach. That’s pretty much where the shelf at the base of the foredune begins, and as high as the the water pushed up the beach. On any King Tide you’ll see a lot of gulls and ravens working the wrack line. They’re looking for a meal, and King Tide promises to push a lot of food up onto the beach. Here’s a scavenger’s gallery from December 22. King Tide is also a delight to the beachcomber. Here’s some stuff I found in the wrack on December 22. Take a look at Wrack Line 2014 to see these and other items I found in the drift in 2014. My old friend on the making tide, between sets. 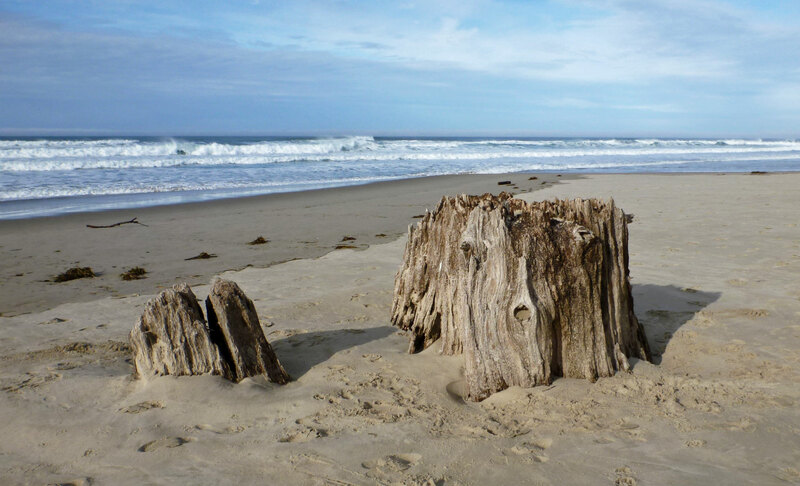 The surf kisses the stump and pushes up the beach just a bit. The highest surge of the day pushed up into the wrack line on the shelf at the base of the foredune. The highest water made 21 paces shy of the vegetation at the base of the foredune and mobilized a small amount of material from the wrack line. The tide prediction was 10.0′. The forecast called for 2′ wind waves and a 12′ west swell. The reach of the tide was just a bit higher than I observed a month earlier, on December 22, 2014 (see photos above). Know your bony fish anatomy? Take a look at Wrack Line 2015 to see these and other items I’ve found in the 2015 drift. The highest surge of the day and the old stump didn’t even get a kiss. The tide prediction was 9.8′. The forecast called for 3′ wind waves and a 5′ swell. Compare this shot with those from December 22, 2014 and January 19, 2015 – the main difference is the size of the swell! If you know what this is, drop me a line. Where’s the nearest pumpkin patch? 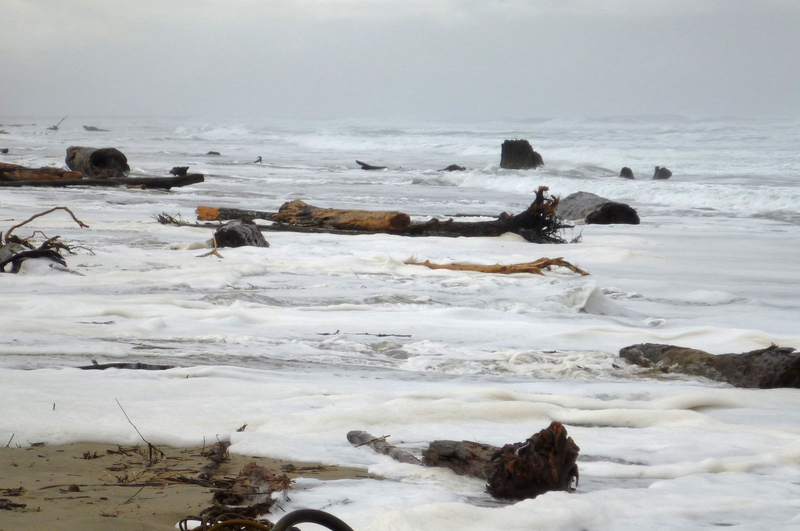 A comparative view of daytime king tides on December 12, 2012 and January 1, 2014 convincingly reveals the effect of swell and wind waves on surge up the beach. 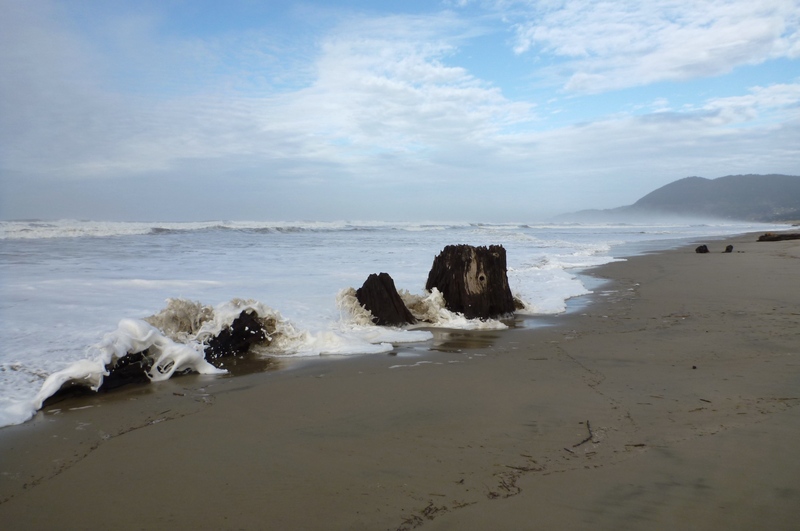 In the two photos above, you see a a pretty good surge up the beach and lots of big wood in the wrack line was mobilized. This is the first and biggest king tide I photographed. January 1, 2014, high tide 10.4′, 5′ swell, 1′ wind waves 1′. 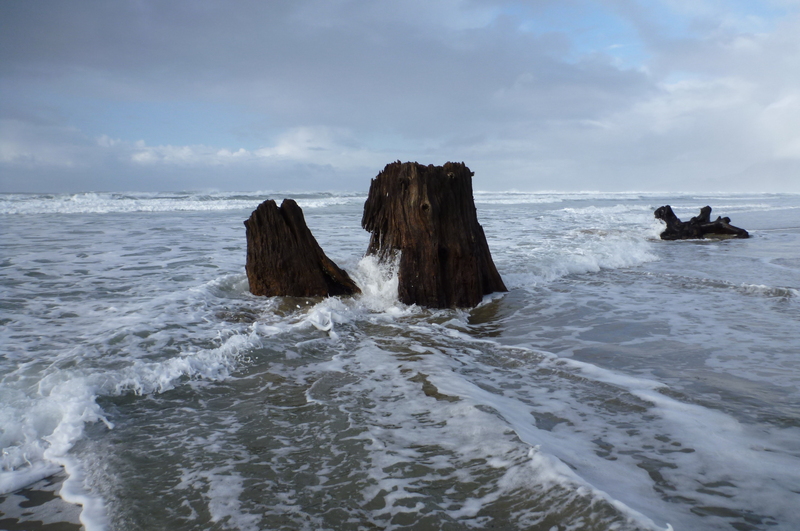 One year later, the tide prediction was the same, but the swell and wind wave forecast was smaller and the big stump didn’t even get wet. The effect is much the same as I showed above in the photos from January 19 and Febraury 18, 2015, above. According to The NOAA tide predictions for South Beach (that’s the station I always use), the highest daytime spring tides of the year, over the last 3 years, range from 10.0′ to 10.4′ above mean lower low water. That’s a range of less than 5 inches; and these tides aren’t much higher than other high tides. In spite of the name, the King Tide effect isn’t necessarily going to be very dramatic. Most of the variation in how dramatic the high spring tides will be comes from differences in the height of the swell and wind waves and, in the estuaries, river flows. I’ll see you out on the wrack line next time King Tide coincides with a big swell. Maybe someday, when you’re not at your desk, we’ll run into each other out on the wrack line. So interesting! You’re doing a fine job recording the changes in the shoreline. Thank you for sharing. Keep it up! Thanks! I appreciate your encouragement.